A weird thing happened today... really weird. Last time I used my PS3 was on friday and everything was working just fine. Today I turned it on and tried to play/test few games - NOTHING WORKED. I tried PS1 game - it gets stuck on black screen and then I get a mandatory "Rebuild database..."... I tried loading GRID2 - it stuck on the main title screen and then when I get back to XMB - the waves lock and I get mandatory "Rebuild database..."... I only managed to start one old game... 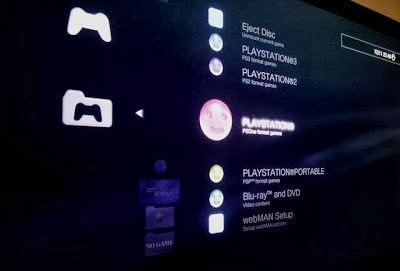 The icons in XMB-GAME disappeared (I have groups)... When I turned off the groups - the icons/games show. Another weird thing - I got an 'envelope'/message icon next to the clock/radar... I don't have PSN account or anything - weird. The only way to make everything work was to shutdown the PS3, disconnect the LAN cable (so no internet) and then all was ok. Connected the cable, restarted - same weird issues. Then removed the spoofing from webMAN, restart - all went to normal again. So there is definitely something wrong and the PS3 gets some data at startup / VSH load and the data it gets breaks something. So... anyway... I added the "disable spoofing" option to webMAN just in case anyone runs into the same issues.